These emotions almost always accompany one of my “slumps,” as I choose to call those periods when I lack any and all motivation to get anything done. Prior to starting my marketing business, a motivational slump might have had such relatively harmless results as an overflowing laundry basket, a brief lapse in personal hygiene (eek!) or even gaining an extra pound or two due to not lacing up my running shoes. These days a slump seems far more dangerous. What if I miss the chance to connect with a potential client just because I’m not feeling up to logging in? Shouldn’t I be posting more blog entries? How negatively does it affect my reputation if I don’t tweet enough? Well, fresh off the high of launching my business, taking a trip to Baja and getting some very promising leads, this past week I found myself smack in the middle of a slump. I should have seen it coming. I was recently moved to a new location in my day job, which means I’m learning and adjusting (read: getting a mental workout) for 45 hours a week right now. I’m feeling less and less satisfied with my day job in general and that leads to frustration that inevitably spills over into my work at home. Though I know I must be patient, I find myself getting worked up over wanting to work on helping others full-time through my business. If I did this more, then I am certain I’d experience fewer slumps. If you spend day and night working on one thing or another like I do, then take the time once in awhile to rest and do nothing. Or do something fun. But don’t allow yourself to work. Sometimes when I relax a little bit, I actually get inspired so much that when I go back to my laptop I perform far better than if I force myself to sit down and write something when I’m not motivated. This is a strategy I apply throughout my life, both at work and at home. Whenever I get overwhelmed to the point of feeling useless, I set a tiny goal that I know I can reach. I definitely have lofty aspirations of bringing together entire communities and driving tourism all up and down the Baja peninsula through good marketing practices. But I can’t get there overnight. Hell, sometimes I can’t even think of anything interesting to put on in the morning! So when I’m in a slump, I write down something I know I can achieve that very day. It may be to organize one of my online accounts, respond to a simple email or even just clean my office. Once you get going, you’ll find it hard to stop. Even if you try your best to get inspired and it doesn’t work, don’t get so down on yourself that you throw in the towel. There is a natural flow to life that includes ups and downs. Keep trying! There are many quotes on the topic of not giving up, but an old favorite comes via a quick story from my own life. When my mom was losing her fight with the unexpected return of her brain cancer, I was five hours away at college. Not sure of anything and scared to death, a teary-eyed co-worker made sure I got safely into my car. As I set out to face the unknown, she whispered in my ear, “Sometimes you just have to fake it ’til you make it.” Meaning things might not be okay today, or tomorrow, or for a long time. But one day they will be, and we have to keep moving forward until that day comes. So get up. Do something. Do anything and do it well. 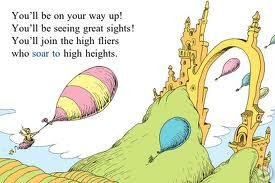 Though, as Dr. Seuss points out in Oh, the Places You’ll Go!, “un-slumping yourself is not easily done.” In another one of my favorite sources of inspiration, he later declares, “Today is your day! Your mountain is waiting. So, get on your way!” Yes!! !